On Tuesday, April 2nd, Amazon announced that 100 high school seniors from 32 states across the country will receive the first-ever Amazon Future Engineer scholarship of $10,000 per year over four years to study computer science at a college of their choice. The scholarship winners will also receive a guaranteed paid internship offer at Amazon after their freshman year of college to gain work experience. Warwick high school senior, Connor Shields, received a very unexpected email Tuesday afternoon when he found out he was one of those 100 students selected. “I’ve always wanted to work for a large tech company like Amazon, and I was worried about how I’d be able to pay for college. 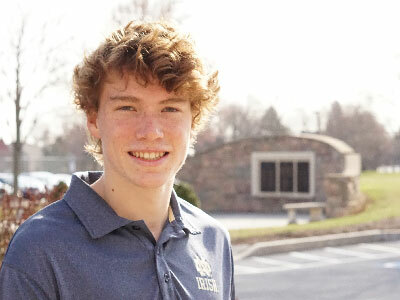 With receiving this scholarship I can now focus on my education and running track, rather than how I would be paying for school,” Connor expressed after finding out the news. “The thought of interning at Amazon in the future is unbelievable to think about, I can’t believe I actually got this and have such an amazing opportunity ahead of me.” Connor will be attending Notre Dame University where he plans to major in computer science and run track. Shields heard about this opportunity through his high school computer science teacher, Mr. Jeff Wile, who started an online community for his students where he posts any computer science careers opportunities that come his way. “This specific one was given to me through the AP Computer Science community I am involved with. An introduction was posted and I felt this was a chance of a lifetime for my students,” stated Mr. Jeff Wile, who Shields says without him he never would have found out about this scholarship. “I want to thank Mr. Wile because without him I would have never taken computer science. It means a lot to me that he always focused on my education and trying to me make better,” said Shields. Launched in November 2018, Amazon Future Engineer is a four-part childhood-to-career program intended to inspire, educate, and prepare children and young adults to pursue careers in the fast-growing field of computer science. Click here to see Connor's reaction to his scholarship.